​The great, overpowering dragon river, the Mekong, is Southeast Asia's largest and with its destiny hangs the fate of Southeast Asia. Some rivers seem young and spring like, dancing in joy with sparkling clear water by green wild banks. The Mekong River is not one of these. It is Southeast Asia's "Big Muddy". The Mekong carries the burden of a thousand histories, of long gone empires and Kingdoms and the wasted dreams of long gone war lords. It also carries the yearly hopes of poor farmers for enough food . It is the future promise of electrical power and irrigation in a hungry world. In Southeast Asia, it is prayed to, praised, cursed and feted, as feared as a dragon and loved as the mother and father of all good things. Every meter has a story to tell and every tributary brings smaller tales from remote mountains. ​The Mekong basin is exploding with life and is one of the richest areas in biodiversity in the world. More than 1200 species of fish have been identified and some say there could be as many as 1700. No other river is home to so many species of very large fish including the giant river carp which which can grow up to 1.5. meters and weigh 70 kilograms. Other large fish in the Mekong are the Mekong Freshwater Stingray which can have a wingspan of up to 4.3 meters, the giant pangasius, the Siamese giant carp and the Mekong giant catfish. Upon these and other smaller fish, the lives of millions of people hang in the balance. Mess too much with the Mekong and catastrophe waits. Other species calling the Mekong home are the Irawaddy Dolphin which are now rare but seen when you visit Kratie in Cambodia. Also, you may see the smooth coated otter and the fishing cat. Even more rare is the Siamese crocodile. Below is a video of the Giant Catfish of the Mekong. 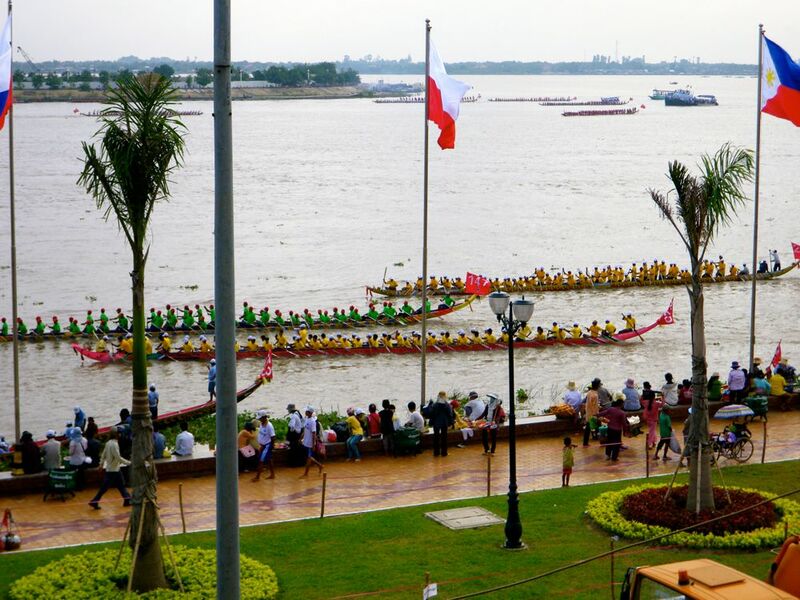 ​With an estimated length of 4,350 km, the Mekong is the 7th longest in Asia and the 12th in the world. From the Tibetan Plateau, the Mekong runs through China's Yunnan Province and then flows southeast between Myanmar and Laos for a 100 km stretch before twisting southwest to form the border between Laos and Thailand. Then, its off east and south into Laos for some 400 kms to define another angle of the Laos-Thai border. It crosses into Cambodia where it receives the Tonle Sap and Bassac rivers in downtown Phnom Penh. Then, it creeps into Vietnam and divides into nine channels made famous in a nearly forgotten war past yesterdays Saigon before leaking the last of tired waters into the South China Sea. 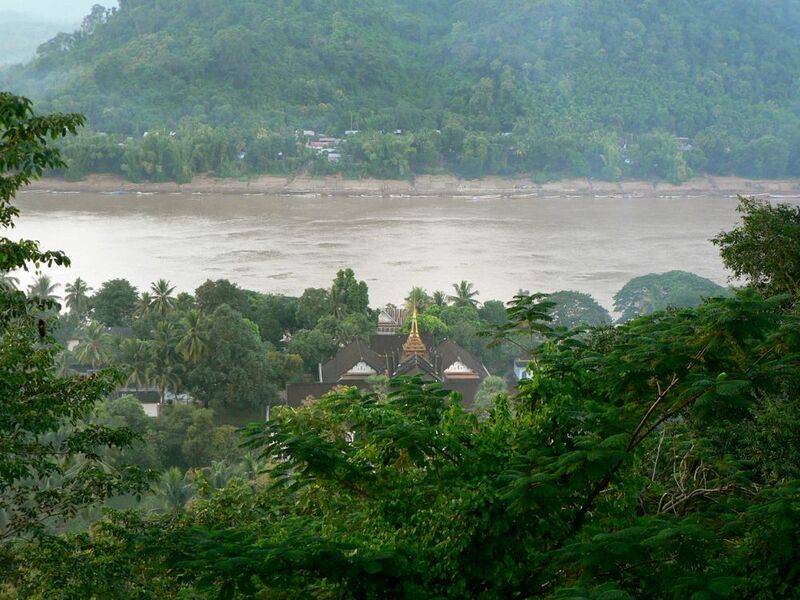 The Mekong is one of the most diverse areas in the world, second only to the Amazon. It is estimated to have 20,000 plant species, 430 mammals, 1,200 birds, 800 reptiles and amphibians and 1200 fish species but new species are also discovered each year. The Mekong has the most concentration of ecoregions in Asia. The Mekong turns out in wild capture fishery about 2 million metric tonnes of fish a year, and an additional 500,000 mt of‘other aquatic animals’ including snakes, snails, aquatic insects and frogs. About 40 million people are involved in this. 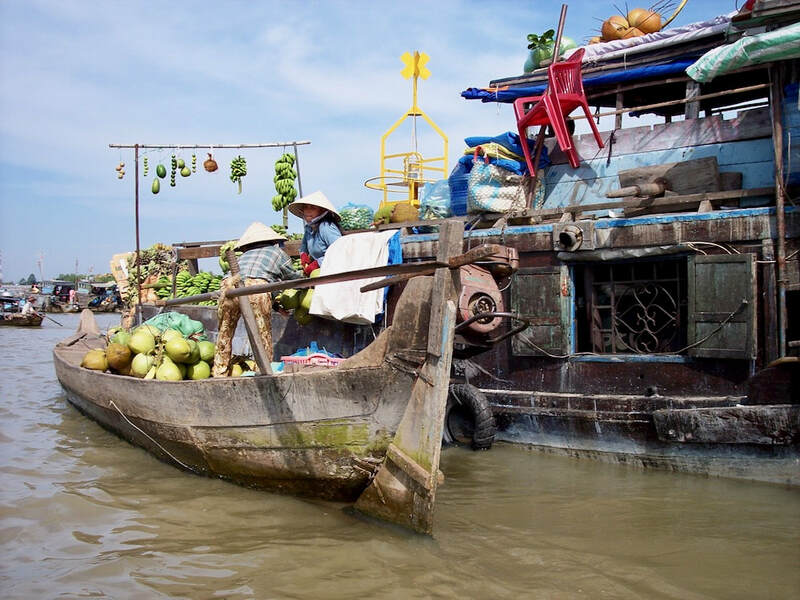 ​We did a tour of the Mekong Delta when we went to Ho Chi Minh and spent the day first ferried by women in their long wooden boats and then brought to the farms where tropical trees bear some of the most exotic fruits you can eat in Asia. It was made more enjoyable by our lady guide who told us Vietnamese folklore and legends. The Mekong Delta has always fascinated not only the Mekong nationals but people all over the world. It is one of the richest fed constantly by the overflow from the Mekong River. Read more about this area that you must have seen on television during the Vietnam war and have an appreciation of what the parties have to go through. ​From the Upper Mekong in the north down to the Myanmar-Thai-Laos border, the river is relatively clear and fast flowing fed by snowmelt that guarantees a relatively uniform circum-annual flow in the river. ​In the Lower Mekong, the river is turbid, muddy, heavy, and like the Nile can replenish tired soil if pumped. The upper and lower Mekong may be one creature, but the family resemblance has a Jeckyl-Hyde perversity. ​Let's have a look back at history. The Mekong has been here forever but is still waiting patiently to be understood. The earliest known settlements along its banks date to 2100 BC. Countries came and went. Empires exploded and then imploded. Ozymandias wept. From around the time of the fall of the Khmer empire in the 900's, the Mekong became the front line between the emergent states of Siam now Thailand and Tonkin (North Vietnam) and lived in a continual battering of the warring armies. It was not until 1540, when the first European that we know of, Portuguese Antonio de Faria came to the Mekong and made the usual impression. There was sporadic interest after that but little was known of the river until 1641-1642 when the Dutch, Gerrit van Wuysthoff, led another up river expedition reaching Vientiane. By the mid 19th century, in the great game, the French took a serious interest in the area capturing Saigon and establishing a protectorate over Cambodia (1863). Who was being protected and from whom? Serious exploration was undertaken by the French between 1866-1868 but they found the river full of falls and rapids and difficult to navigate. Ah deary me colonial management is such hard work! By 1893, the French extended their control to Laos forming what then was called French Indochina. Pyotr Kuzmich Kozlov found the river source in 1890 but as he wasn't French, no one much cared. After the French relinquished control, the Mekong was seen as a kind of no man's water and left to the local fisher folk, travelers and invaders until the formation of the Mekong River Commission in 1995. 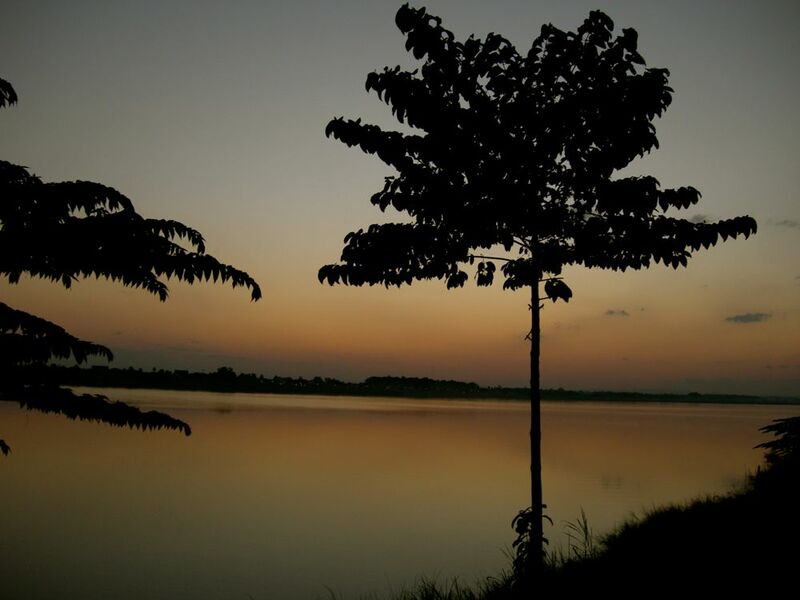 The Mekong River Commission formed on 5 April 1995 by an agreement between the governments of Cambodia, Lao PDR, Thailand and Viet Nam to manage their shared water resources and develop of the economic potential of the river. China and Myanmar became Dialogue Partners of the MRC in 1996 and these countries now work together within a cooperation framework. However we're not talking a passive resource or a wild animal park. The river is life or death to millions and winners and losers in this commission have massive stakes. The Mekong River Commission provides the institutional framework to promote regional cooperation in implementing the 1995 Agreement on the Cooperation for the Sustainable Development of the Mekong River Basin, and it gives a neutral focus for agencies like the ADB and International donors to try to build a sense of joint ownership and responsibility for a resource that has been fought over for millennia. The MRC supports the Mekong Program, a Regional Cooperation Programme for the Sustainable Development of Water and Related Resources in the Mekong Basin. 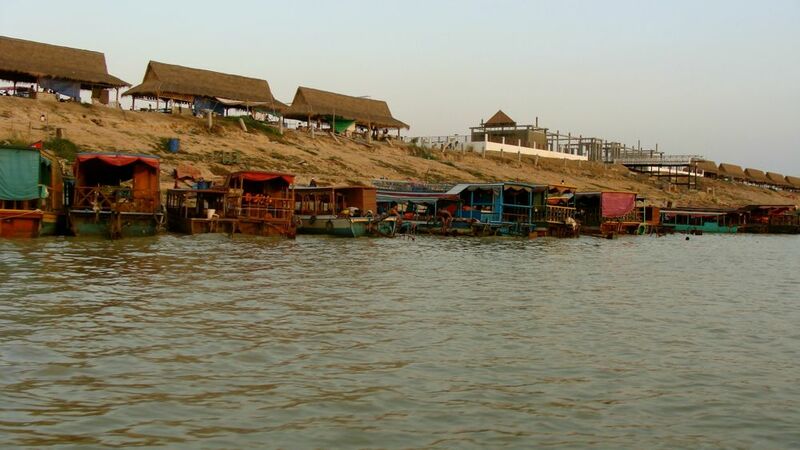 Environmental concerns are many in the Mekong. Foremost of these are the building of more dams and the blasting of the rapids. A number of dams have already been built on the river's tributaries. There is the Pak Mun Dam in Thailand criticized for its damage to the environment and to the livelihoods of affected villagers. China is engaged in an extensive program of dam-building on the river itself with three already completed and another twelve under consideration. Since the building of these dams, many species have become endangered including the Mekong Dolphin, water levels have dropped causing ferries to get stuck and making ferry travel longer, river blockage problems and fish catch have been cut into half. Villagers completely dependent on the river are worried. Countries along the Mekong have complained about increasing pollution from pesticides runoff and heavy industry waste as well as the potentially devastating low water flow. Other environmental concerns arise from increased water flow in some parts as China clears rocks and sandbars, blasts gorges, and slows water as it dams and floods other sections. Cambodia is by far the most exposed because of its poverty level. Some of Laos and Vietnam's biggest cities hug the Mekong and would be vulnerable to low water flows and pollution. This 1260 megawatt dam is now submitted for approval with the Mekong River Commission. Many ocmmunities along the Mekong are opposed to the construction of the dam in Laos as this will affect their lives. As one Mekong resident said, " we catch less fish, have water pollution and get health problems if we use the water". Another one added that this will destroy the seasonal riverbank crops. ​NGOs are supporting the villagers in their opposition to this dam as well as foreign donors and ask for a moratorium on dam building for at least 10 years as other countries along the Mekong also plan to build more dams. Recently, Laos announced that they will start building the dam as they claimed they have responded adequately to the concerns of the other Mekong countries. This bothers the villagers involved as they are aware that their livelihood will be impacted. This dam is said to be finished in 2019. Although already about 30% finished, neighbouring countries have expressed serious concerns. ​Walker Stephens, a volunteer based in Kratie with a strong passion for life in the Mekong River organized a flotilla of inner tubes to journey down the Mekong about 20 kms. from the Kampi dolphin pool. The event is to have fun and celebrate the Mekong and the life it gives so many people at the same time highlight the impending decision on the 1,200 megawatt Xayaburi dam proposed in Laos. 95% of the energy generated in this dam will be exported to Thailand so Laos but especially Cambodia and Vietnam will not benefit from it. Instead, it threatens its 300 million fresh water fishery and rice production that depends largely on the Mekong. This dam is only the first of 11 other proposed dams in the Mekong. For 10 days, Jeff Dean (American) and Nathalie Samson (Canadian) run through the Mekong on the Cambodian side, about 500 kms, to raise the issue of the lack of pure drinking water in the rural areas. They set out from O'Svay in Stung Treng province on a route that took them through Kratie, Kampong Cham, Kandal, Phnom Penh towards their home base in Kaoh Kok, Prey Veng close to the Vietnamese border. They covered 50 kilometers a day. They raised funds for a non profit organization, One Filter One Family, which provides water wells and bio-sand water filters for poor families in the rural areas. ​This hour river boat cruise on the Mekong and a tuktuk drive to the village of Pum Taskor where an NGO, New Shoots, will showcase their school, medical centre and domestic water treatment unit is quite an experience. This community tourism program will be followed by a visit to the Mekong Gardens or if you like, work in the rice paddies, planting or harvesting rice depending on the season. Or if the season is not for this, then, watch the villagers make mats. 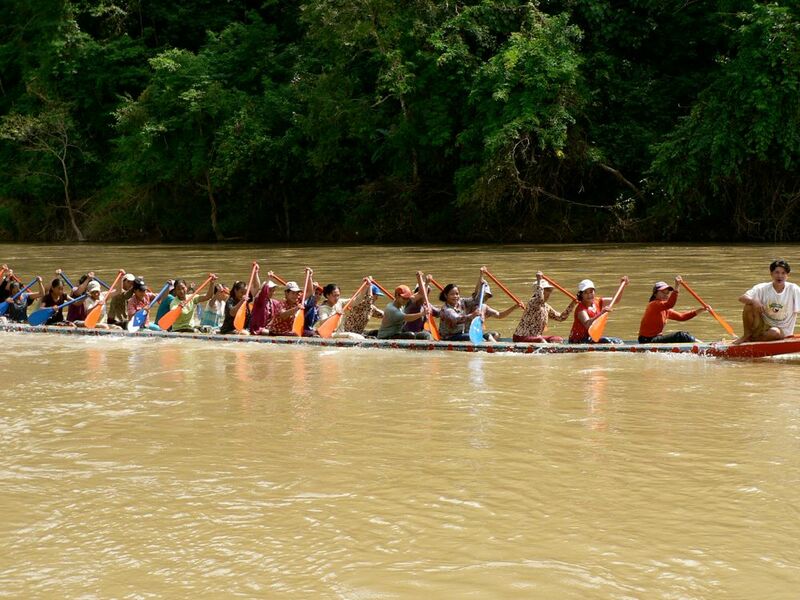 "Clean River, Good Community" is the theme for this year's celebration to honour the gift of nature providing sustainable livelihood for millions of people along its 4,300 kilometre route. The theme hopes to highlight the danger that high level of pollution does to Asia's largest river. ​This 3-day celebration was held in Kampong Cham where stalls sold Cambodian products. Traditional games were also played. For the run that started the festival, about 1800 participated. A charger to bring with you on your trip to the Mekong: Anker 2nd Gen Astro E3 Ultra Compact 10000mAh Portable Charger External Battery Power Bank with PowerIQ Technology for iPhone 6 Plus 5S 5C 5 4S, iPad Air 2 Mini 3, Samsung Galaxy S6 S5 S4 Note Tab, Nexus, HTC, Motorola, Nokia, PS Vita, Gopro, more Phones and Tablets. 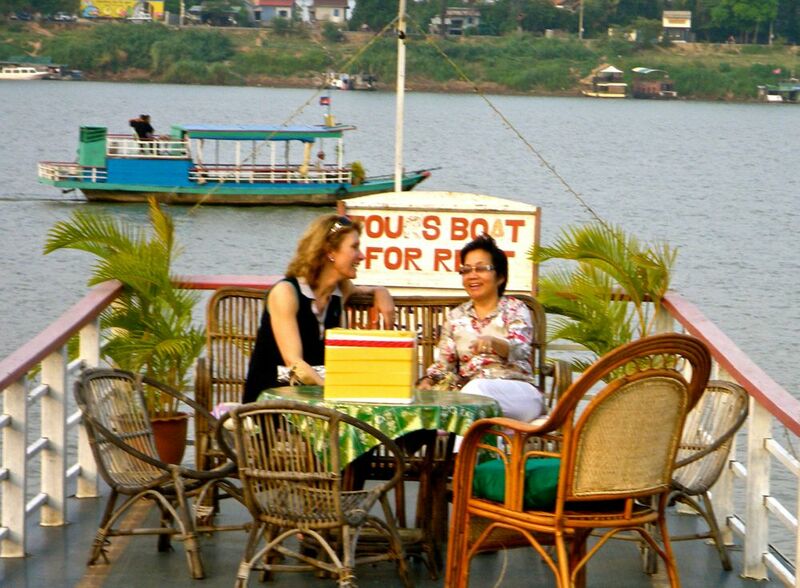 Have you cruised the Mekong? Share your thoughts.